Peter Abbarno represents clients injured in car accidents, injured at work, or injured due to the negligence of others. Peter Abbarno is a community leader and local attorney. Peter graduated from the State University of New York at Fredonia in 1997 with a Bachelor of Arts degree in Political Science. For almost 10 years, he worked in the field of government and politics as a media and policy coordinator, campaign manager, and executive director of statewide political non-profit organizations. In that capacity, he assisted candidates and political parties to comply with state and federal campaign finance and election laws. Peter earned a Juris Doctor from Vermont Law School in 2008 and a Masters of Law in Taxation from the University of Washington in 2009. In 2010, Peter joined Olson Althauser Samuelson & Rayan, LLP, currently known as Althauser Rayan Abbarno, LLP. He became partner in 2013. 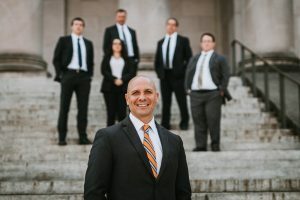 Prior to working for Althauser Rayan Abbarno, Peter worked as a Deputy Assistant Prosecuting Attorney in King County and attorney with the University of Washington’s Federal Tax Clinic. Peter is an injury attorney and dedicates his practice to helping injured workers navigate the complex workers compensation laws and those injured in automobile accidents, slip and falls, and due to the negligence of others. Peter is past president of the Lewis County Bar Association and board member of the Centralia Downtown Association and United Way of Lewis County. Peter is the current president of the Centralia College Foundation, an elected City Councilmember in the City of Centralia , and serves on the board of many organizations, such as the Lewis County Bar Legal Aid, the Lewis County Economic Development Council, and the Boys and Girls Club of Chehalis. Peter also hosts the daily morning show “Let’s Talk About It” on KELA AM1470 at 8:30am. Peter enjoys spending time with his wife Holly Abbarno (Hawes) and two children, Sophia and Antonio, as well as, running, wine tasting, and is an avid comic book collector.